Terra Forming Terra: The World Is More Educated Than It’s Ever Been—How? The World Is More Educated Than It’s Ever Been—How? This is one trend that keeps rising as it should. Whether it produces the same quality is almost irrelevant. What it does do is establish who can be trusted with leadership. After college, skill levels become for specialized and specific and reach demanded standards. It continues to be the best capital investment possible for a government. Simply put, it determines professional income production as against trade income production. A factor of two easily applies and over at least forty years. That translates into a tax recovery several times greater for the professional. Over a lifetime, that means a gross income near $2,000,000 for a skilled tradesman as against perhaps $5,000,000 for any professional. For that reason alone all education should be ultimately be paid for by government. Obviously, even the most backward governments are catching on. More people are going to school and university than ever before. That’s the largely positive picture of the state of education across the world published recently by the Organization for Economic Cooperation and Development (OECD). The OECD’s Education at a Glance report doesn’t explain all the reasons for the changes taking place, but it does show some remarkable trends. 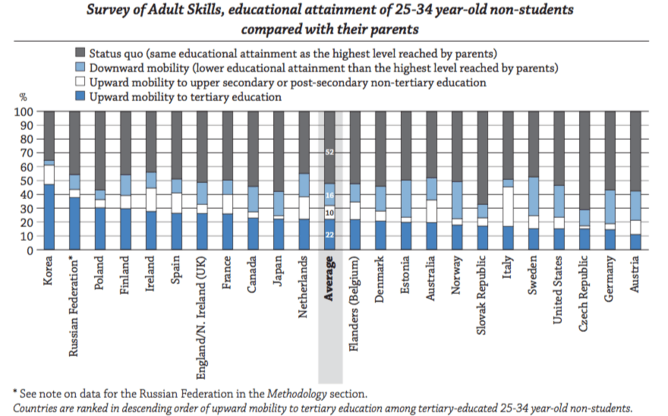 A third of adults in OECD countries held a tertiary-level qualification in 2014. Over the past 30 years there has been a “significant increase” in the educational attainment of populations in almost all OECD countries. 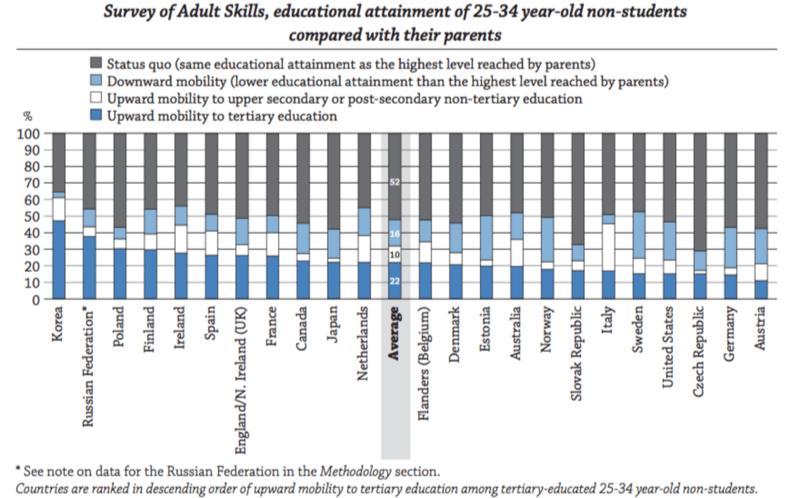 The graph below shows this by comparing the education levels of young people and their parents. South Korea has also raised enrollment in higher education—demonstrating a considerable increase in upward mobility as measure by the number of young people going to university whose parents had not. In some other countries—notably Austria, Germany, and the United States—there has been more limited upward mobility. Other data shows that in the space of one decade between 2000 and 2010, China increased the number of young people completing secondary education by 30 percent. This almost certainly reflects both the country’s massive economic growth over this period as well as the increasing urbanization of the population. Over recent years, China has also moved rapidly up the OECD’s Program for International Student Assessment (PISA) tables of pupil performance and has hugely expanded its university population both at home and abroad. Of course, quantity does not equal quality—and even in some countries that perform highly on the PISA tests there are questions remaining about the versatility and creativity of otherwise highly literate and numerate students. It is always dangerous to conclude too much from such international comparisons: each nation has its own particular historical and present-day social, cultural, and economic contexts which strongly influence education. There are also “gaps” in the data from certain countries, so the OECD report does not provide a comprehensive account of every system in the world. Still, those countries whose enrollment rates in higher education remain static ought to be concerned. The report clearly highlights the benefits of a university education, both for the individual and wider society. The higher your level of education, the more likely you are to feel healthy, to earn more, to take part in volunteering and to be politically engaged. It is widely accepted that higher levels of education at all levels contribute to a wider range of other positive social, political, and economic outcomes. Better education can even have an effect on reducing the likelihood of conflict and war. The education of women and girls has very positive effects. UNICEF states that, “each extra year of maternal education reduces the rate of mortality for children under the age of five by between 5 percent and 10 percent.” The evidence noted in both the OECD report and other available data sources suggests that historic gender inequalities in education are being flipped on their heads. Yet despite overtaking men in educational attainment, women remain under-represented in certain areas of study, such as engineering and manufacturing. And having a better education has not closed the pay gap between women and men. University-educated women tend to earn only around three-quarters of the pay of men with the same level of education, according to the OECD. Education, globally, is improving. But this has happened mainly during an era of considerable investment in education systems both in the developed and the developing world. More recently, the global financial crisis has led to cutbacks in state spending on education in some nations. The OECD said that the annual growth in education spending between 2008 and 2012 decreased continually and there was no growth in investment in 2011–2012. Across the OECD, figures suggests there is significant net public return on investment in tertiary education—1.2 times the cost of a woman’s education and 2.5 times the cost of a man’s education, when all related costs and benefits are taken into account. Cutting back on education expenditure would appear to be a false economy if our ambition is for better education worldwide. Alan Britton is a senior university teacher of social justice place and lifelong education at the University of Glasgow in the U.K. This article was originally published on The Conversation.